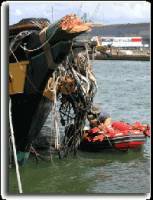 On Monday, September 5, 2005, Pride of Baltimore II experienced a catastrophic rig failure, which also resulted in the collapse of both masts, while sailing in the Bay of Biscay, off the west coast of France. I just heard About this and have been scanning through the net for the last hour reeling from it. The images are amazing. The fact that they were able to save all that they did without injury is truly astonishing. The incident occurred when the Ship was underway during a Squall. The Bowsprit broke About halfway along its length, in turn bringing the Rigging down. 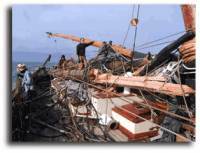 With no support system, the Foremast splintered and collapsed, hitting the Mainmast on the way down. 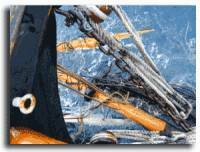 The wire Rope stays that Secure the Foremast are also fixed to the Mainmast, so it too broke off under the strain of the sea swells About 25 feet above the Deck. 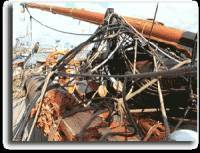 The Mainmast then splintered and also came down. 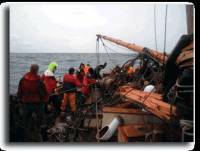 The Captain and crew responded quickly, and due to their excellent seamanship, were able to retrieve much of the materials. They were able to motor the vessel the 80 miles to Saint-Nazaire on the French coast of Biscay Bay where the vessel is now moored and under repair.